Fort Pickens is a pentagonal historic United States military fort on Santa Rosa Island in the Pensacola, Florida, area. It is named after American Revolutionary War hero Andrew Pickens. The fort was completed in 1834 and remained in use until 1947. Fort Pickens is included within the Gulf Islands National Seashore, and as such, is administered by the National Park Service. After the War of 1812, the United States decided to fortify all of its major ports. French engineer Simon Bernard was appointed to design Fort Pickens. Construction lasted from 1829 to 1834, with 21.5 million bricks being used to build it. Much of the construction was done by black slaves. Its construction was supervised by Colonel William H. Chase of the U.S. Army Corps of Engineers. During the American Civil War, he sided with the Confederacy and was appointed to command Florida's troops. Sketch of Fort Pickens, Florida, by Lt. Langdon, 1861. 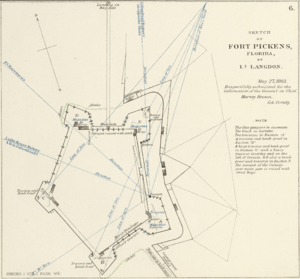 Fort Pickens was the largest of a group of fortifications designed to defend Pensacola Harbor. It supplemented Fort Barrancas, Fort McRee, and the Navy Yard. 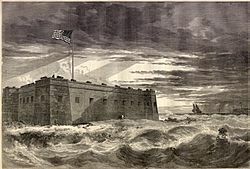 Located at the western tip of Santa Rosa Island, just offshore from the mainland, Fort Pickens guarded the island and the entrance to the harbor. On the night of 20 January 1858, the USCS Robert J. Walker was at Pensacola when a major fire broke out at Fort Pickens. The cutter's men and boats, joined by the hydrographic party of the U.S. Coast Survey steamboat USCS Varina, rallied to fight the fire. The next day, the captain of the Robert J. Walker received a communication from Captain John Newton of the Army Corps of Engineers, who commanded the harbor of Pensacola, acknowledging the important service rendered by the Robert J. Walker. By the time of the American Civil War, Fort Pickens had not been occupied since shortly after the Mexican–American War. Despite its dilapidated condition, Lieutenant Adam J. Slemmer, in charge of United States forces at Fort Barrancas, decided the fort was the most defensible post in the area. He decided to abandon Barrancas when, around midnight of January 8, 1861, his guards repelled a group of local civilians who intended to occupy the fort. Some historians claim that these were the first shots fired in the Civil War. Montgomery C. Meigs, an Army engineer, was ordered by President Lincoln and Secretary of War Seward to Fort Pickens. During the war, Meigs would also construct the Washington Aqueduct and the dome on the U.S. Capitol in Washington, DC. Captives from Indian Wars in the West were transported to the East Coast to be held as prisoners. From October 1886 to May 1887, Geronimo, a noted Apache war chief, was imprisoned in Fort Pickens, along with several of his warriors. Their families were held at Fort Marion in St. Augustine. During the late 1890s and early 20th century, the Army had new gun batteries constructed at Fort Pickens. These batteries were part of a program initiated by the Endicott Board, a group headed by a mid-1880s Secretary of War, William C. Endicott. Instead of many guns concentrated in a traditional thick-walled masonry structure, the Endicott batteries are spread out over a wide area, concealed behind concrete parapets flush with the surrounding terrain. The use of the accurate, long-range weapons eliminated the need for the concentration of guns that was common in the Third System fortifications. Battery Pensacola was constructed physically within the walls of Fort Pickens, while other similar concrete batteries were constructed to the east and west as separate facilities. The ruins of these later facilities are also included in the Gulf Islands National Seashore complex. As at many posts, obsolete weapons were repurposed during WWI; Battery Cooper's 6-inch M1905 guns on disappearing carriages were removed in 1917, but a piece located at West Point was moved to Battery Cooper in 1976. On June 20, 1899, a fire in Fort Pickens' Bastion D reached the bastion's magazine, which contained 8,000 pounds (3,600 kg) of powder. The resulting explosion killed one soldier and obliterated Bastion D. The force of the explosion was so great that bricks from Bastion D's walls landed across the bay at Fort Barrancas, more than 1.5 miles (2.4 km) away. As with many other forts, Panama mounts were planned for in the interwar era, beginning in 1937. Four 155mm GPF guns were placed around Battery Cooper, two forward, and one to each side, in 1942. The 155 battery used Cooper's magazines, communications, and other support facilities. Fort McRee was built on Perdido Key across Pensacola Pass from Fort Pickens. Abandoned by Union forces and taken over by Florida and Alabama militia in January 1861, it was badly damaged by Union bombardment during the American Civil War later that year. Abandoned by Confederate forces, Fort McRee remained in ruins for the next three decades. Although improved in the late 19th century during the run-up to the Spanish–American War, the fort was struck by a hurricane 26–27 September 1906 that destroyed most of the newer structures erected since 1898. After the hurricane, only a minimal caretaker staff was based there to ensure security of the site. Due to its site being accessible only by foot or boat, Fort McRee was left to the elements. Storms and erosion have battered the site; today, nothing more than a few scattered foundations remain. Fort Barrancas, which was built around previously constructed 17th- and 18th-century Spanish forts, as well as Fort Barrancas' associated Advanced Redoubt approximately a mile (1.6 km) to the northwest of Fort Barrancas, are located across Pensacola Bay on the grounds of what is now Naval Air Station Pensacola. When Union forces abandoned Fort McRee in 1861, they also abandoned Fort Barrancas, pulling back to Fort Pickens. This fort was also occupied by Florida and Alabama militia forces, who were subsequently integrated into the Confederate forces. In May 1862, after hearing that the Union Army had taken New Orleans, Confederate troops abandoned Pensacola and Fort Barrancas. The fort reverted to Union control. Fort Pickens Facts for Kids. Kiddle Encyclopedia.